In May 1974 Sparks did the BBC's flagship music show "Top Of The Pops". Russell Mael had manic wide-eyed hyperactive movements while his brother keyboardist Ron frightened the nation's children. Russell & Ron Mael were shocked at the show's power, their first TOTP performance had a tremendous effect. The next day people stopped them in the street and Radio One DJs were talking about that creepy guy with the moustache. The "Kimono My House" Lp peaked in the UK at #4 and the single "This Town Ain't Big Enough For The Both Of Us" had quickly jumped to #2 on the British pop charts. 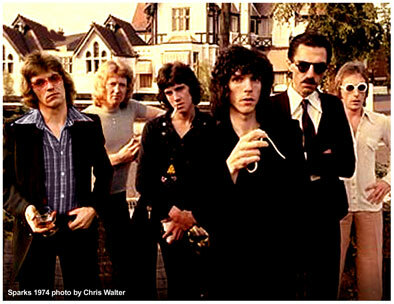 Sparks was voted brightest hopes for 1975 in a Melody Maker readers' poll. 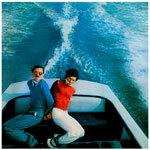 Ron Mael : "It was us and Roxy Music at the time, with people wondering what we'd do next, who'd look like what." Now Sparks had to tour to promote the "Kimono My House" album. As previous bass player Martin Gordon quarreled frequently with Ron Mael & Russell Mael, he was fired after "Top Of The Pops" had been broad-cast and Sparks manager John Hewlett drafted Jook's bassist Ian Hampton to replace Martin Gordon in the band. 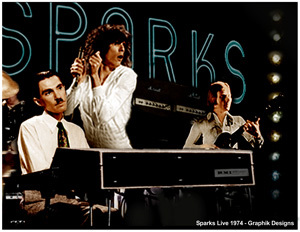 Sparks also had hired keyboardist Peter Oxendale to be able to reproduce correctly things from the record live on stage but the Maels finally decided to add the line-up a second guitar player instead of a keyboardist and "Sir" Peter Oxendale was replaced in the live tour unit by Jook's guitarist Trevor White. 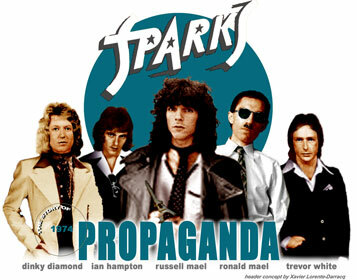 In spring 1974 Sparks new line-up was as followed : Russell Mael on vocals, Ron Mael on keyboards, Dinky "Norman" Diamond on drums, Ian Hampton on bass and guitarists Adrian Fisher & Trevor White. A second single from "Kimono My House", "Amateur Hour" b/w "Lost And Found" proved to be a worthy successor to "This Town Ain't Big Enough For Both Of Us". The song was successful with British and European public and rose to #7 into the charts.